From Thanksgiving through the New Year, MSC Cruises — the Swiss-based world’s largest privately-owned cruise line and market leader in Europe, South America and South Africa — is creating extraordinary onboard experiences, with a host of seasonal touches ensuring guests have an unforgettable holiday season. Guests will spend Thanksgiving Day at sea enjoying festive entertainment, a traditional Turkey dinner and all-day Thanksgiving football displayed on multiple large screens in the sports bar. Kids ages 3-11 can participate in a special Turkey Day cooking class and aThanksgiving Day costume parade and show. A Thanksgiving scavenger hunt, flash mob and party will take place for children ages 12-17. Prices start at $699.50 per person*. During Christmas, MSC Divina will be decked out in the best traditional trimmings, with sparkling lights, shimmering decorations, festive Christmas trees, and a spectacular gingerbread village created by MSC’s pastry chefs. Adding to the festivities, guests will enjoy traditional Christmas carols; a Broadway-style festive show; a special Christmas market place, selling a range of Christmas gifts and traditional decorations; Christmas-themed cooking classes, arts & crafts, and parades; a visit by Santa Claus who will present a gift to every child on board; and seasonal Christmas movies played on an outdoor jumbo screen throughout the week. A Christmas mass will also be available onboard. MSC Cruises knows that the holidays are also about enjoying seasonal delights. Thus, guests will enjoy a Christmas Eve Gala dinner and a special Christmas lunch consisting of traditional holiday specialties as well as festive cocktails served throughout the cruise such as the Christmas Star, made using a mixture of limoncello and Prosecco, and the Snowflake, made with dark rum and fresh banana. For those celebrating Hanukkah, MSC Divina will host a nightly Menorah lighting as well as serve traditional Hanukkah foods in the buffet and main dining rooms. A large menorah will also be on display in the main atrium. Special kosher meals can be ordered in advance. Prices for the Christmas and Hanukkah cruise start at $999.50 per person*. Guests sailing on this 7-night cruise will celebrate the New Year in style. The festivities will start with a special New Year’s Eve Gala Dinner before guests head up to the pool deck for the ship’s annual New Year’s Eve dance party, complete with themed decorations, a countdown to midnight, and champagne. Guests will also enjoy a special New Year’s lunch as well as special seasonal cocktails. For those traveling with kids, MSC Cruises is extending the kids club hours and offering babysitting in the kids club for free so that parents can enjoy New Year’s celebrations. Prices start at $799.50 per person*. For those that like to plan in advance, it’s not too early to start booking your 2017 holiday vacations. 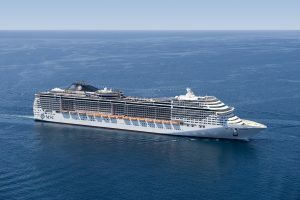 In fact, for those looking to be one of the first to experience the revolutionary new cruise ship MSC Seaside, now is an ideal time to book the Christmas and New Year’scruises. The first 7-night sailing on MSC Seaside out of Miami will take place during Christmas 2017, embarking on Dec. 23rd with stops in St. Maarten, Puerto Rico and the Bahamas. The following week, MSC Seaside will embark on its New Year’s cruise, leaving from Miami onDec. 30th with stops in Jamaica, Cayman Islands, Mexico and the Bahamas.